1) In a pan, heat some oil and saute the chana dal, curry leaves and dried chilli for 3 mins on med heat. 2)Add in the chopped onions, tomatoes and ginger and cook for another 3 mins. 3) Add in the coconut and mix well, add some salt to taste. 4) Let it cool a little and blend in well in a blender until it's a thick puree. 5) In a smal pan heat some oil and add mustard seeds, when seed are done popping, add some Hing and pour over the chutney. Mix and eat!!! 3) Let it cool and blend it to make a smooth puree. At this point, add a little salt to taste a some lemon juice is tomatoes are not sour. This chutney should be a little tart and spicy. In a pan, heat up some oild an cooked the soaked urad daal till light brown. Remove and set aside. Add in the onions and saute for 3 mins. Add in turmeric powder, Fresh paste salt to taste and cook for another 2 mins. Add potatoes, urad daal and corriander powder. 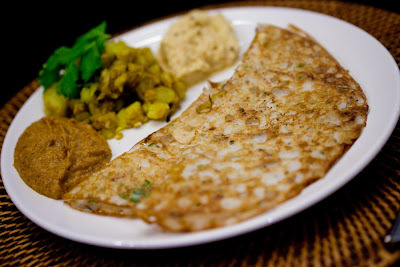 Mix well and serve with Dosa.